My School Of Rock presents "The Art Of Percussive Guitar" - A Masterclass by Dhruv Visvanath. During this masterclass Dhruv Visvanath will guide you through the pecussive parts of the acoustic guitar, coordination, rhythm and Writing great music. By the end of course you will learn the techniques to turn your acoustic guitar in to a full band using the percussive elements taught in the masterclass. Multi-instrumentalist, composer, singer- songwriter and the only Indian to be mentioned in Acoustic Guitar Magazine USA ‘s “30 Great Guitarists under 30” (2014). His latest project, the release of his new album, Orion, launched on the 19th of September, is an eclectic mix of percussive, electro-acoustic, and hard rock with jumpy riffs, best defined as a labour of love, representing his many avatars as an artist. 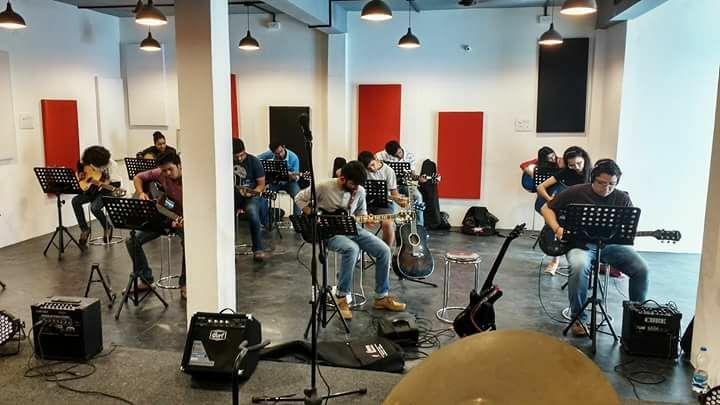 My School Of Rock offers the best music lesson methods for Guitar, Drums,Keyboard and Vocals out there and we will continue to lead the music learning revolution and keep defining the future of music education. The mission of My School Of Rock is to educate, train and develop students to excel in music. Cultivating the musicianship of all our students is the foundation of our curriculum. At My School Of Rock, you will find your own voice and develop your own style.The music courses @ MSOR are continually reviewed and evaluated so that they are up to date and consistently reflect today's musical enviornment.